A general purpose heavy duty mobile 2-tier tea trolley with 100mm castor wheels, complete with integral safety rails and easy clean laminated tops which have no corners to trap debris. 100mm Braking Castors (as illustrated) can be fitted as an optional extra. 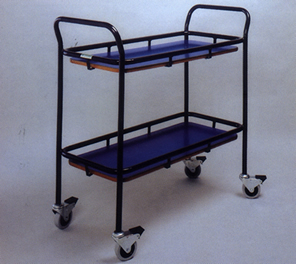 British Manufacturers of heavy duty hospital chairs, trolleys and bariatric equipment.